The Carbon-Lite backpack is the lightest, most powerful commercial backpack vacuum available today. The Pulse Power motor has 121″ of lift! The Carbon-Lite also doubles as a blower on the 10 Qt units. The tough and durable Titanium and Aluminum attachment components, extremely lightweight body, and also the addition of the Z-Glide tool upgrade are all standard on the Carbon-Lite and help in setting this machine at the top of the backpack world. It filter’s the air with HEPA filtration, down to 0.3 microns. Poly Carbon material combined with the industry’s most powerful Pulse Power motor gives you unmatched performance.The Never-Clog tapered hose is an industry first and patent pending. 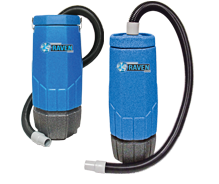 The hose starts at 1.5″ and grows to 3″ as it enters the vacuum. The Backrest is suspended away from the vacuum, keeping your back cooler and allows more comfort. Our exclusive premium Ultra-Glide cord slides easily across floors and resists cord twisting. See Videos Below to Learn More. With Hose & 1-/2” Very Deluxe Tool Kit, 50′ Cord. Ideal for difficult to reach areas: cinemas, theaters, trains, airplanes, stairs etc. straps allows to use it many hours a day without straining the operator. 700W for the Electric version only. The Electric version is class “A+". of 115V-400hz for use in aircrafts. powerful carpet cleaner for any kind of textile flooring. System) converter can be installed. ​Our lightweight, comfortable backpacks help your crew fly through the job, with less fatigue and fewer injuries. Portable and maneuverable, they're engineered to help teams clean faster, better and more comfortably. TRANSPORT™ QuietClean® Backpack Vacuum SC412B - Increase productivity with the versatile TRANSPORT™ QuietClean® backpack with a 50-foot pigtail cord and included tools for carpet, bare floor, upholstery, stairs and more. Clean 24/7 at 69 dBA with this LEED Qualified and CRI Bronze certified backpack. TRANSPORT™ QuietClean® Backpack Vacuum SC535A - Increase productivity with the versatile TRANSPORT™ QuietClean® backpack with a large 10-qt.-capacity bag, 50-foot pigtail cord and included tools to clean carpets, bare floor, upholstery, stairs and more. Clean 24/7 at only 63 dBA with this LEED Qualified and CRI Gold — their highest rating — certified backpack. Cushioned harness designed with load dispersion technology for added user comfort. Tackle the Most Demanding Cleaning Challenges! The Raven Backpack is designed for vacuuming carpet, hard floors and upholstery. Worn on the back to allow for easy and quick vacuuming while walking. Ideal for hallways, airplanes and commercial spaces. Contact us about 230 Volt Models!